December's birthstone is a turquoise gemstone which is regarded as a love charm and a symbol of good fortune and success. Turquoise is believed to relax the mind and protect its' wearer from harm. Turquoise rings, in particular, are thought to keep away evil spirits. If you are looking for a little more sparkle in your birthstone jewelry, the blue zircon Swarovski Crystal is the birthstone for you. These lovely petite handmade gemstone earrings feature delicate howlite turquoise teardrops individually wire wrapped to sterling silver ear hooks. 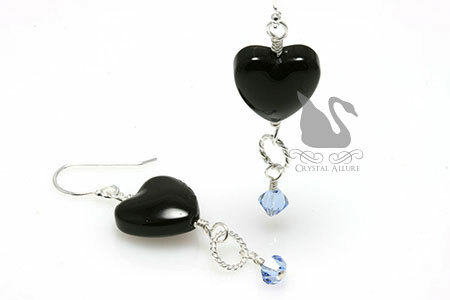 Length is a dainty 3/4" from the bottom of the ear wire. Genuine fine turquoise is both beautiful and rare. For these reasons, there is much more demand than there are stones, making it costly to use in jewelry design. An affordable turquoise substitute is howlite turquoise which is dyed to be the preferred turquoise color of robin's egg blue. Howlite is opaque and either white or grey with grey, black or dark brown veins running through it. The howlite gemstone has a veining pattern that is very similar to (but not identical with) the matrix of turquoise. It is a porous stone, just like turquoise, making it easy to take on dye color. Howlite's porous nature makes it the perfect imitator stone and has often been mistaken for genuine turquoise, red coral and even lapis lazuli. For these reasons, many jewelry designers will use howlite turquoise in their designs making the pieces much more affordable and wallet friendly. 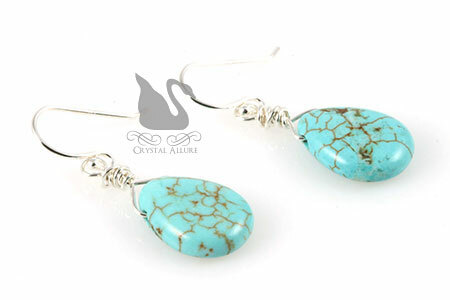 The beauty of howlite turquoise is that it has the color of turquoise, but the stones are howlite. Jessica contacted me because she was interested in our Red Heart Transplant Awareness Survivor Bracelet (B173-HRT). She was looking for a special bracelet to gift to her Aunt Patricia, who just received a life saving transplant. 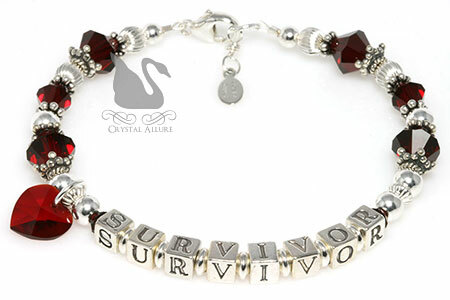 After discussing her options, Jessica decided on having a custom beaded survivor bracelet designed to honor and celebrate her aunt. As an artist, it's difficult to put into words how a design will just come to mind, simply by conversing with the customer. 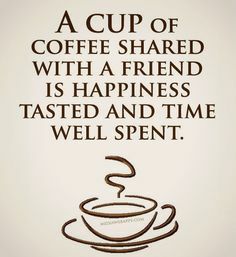 I will generally gather some basic information on what they desire in the design (or don't desire), if there are any special colors, symbols or words they'd like to see in the design -and it is during these conversations that a design will just begin to form in my mind. For all the custom jewelry designs I've created, I believe only once did I change/tweak the design a little more to accommodate the customers' wishes. I am always so overjoyed when a customer is thrilled with their own personalized bracelet! While talking with Jessica, what came to mind was a design idea that I have not used in all the years I've been creating. I was inspired to create a heart charm near the center of the design, instead of at the clasp which is where I generally place charms -and the final design was perfect! Along with Patricia's Custom Red Heart Transplant Survivor Bracelet (BA218), I included a sweet pair of petite red Swarovski Crystal drop earrings to match. As with all my awareness jewelry designs, they serve the purpose of raising awareness. Did you know? Heart disease is the No. 1 killer of women and is more deadly than all forms of cancer*. That's a scary statistic ladies! You can help raise awareness of heart disease in women and make a difference simply by sharing this blog post. And let's make this beautiful heart awareness bracelet the most pinned over on Pinterest! The beauty of my job, as a jewelry designer, is that I get to design unique handmade creations, for special people, that will be cherished for years to come. Each of my custom pieces are infused with memories, special moments and meaning. You may remember The Great Beaded Pumpkin Zipper Pulls Charms post, where I shared the inspiration for our Halloween Pumpkin Crystal Lampwork Beaded Keychain (K103) was another artisan's pumpkin drawing. This dear friend has a heart of gold and is always thinking of others. She wanted the original design and requested three additional custom pumpkin beaded keychains, to give as handmade gifts to her three step-daughters, which she considers as her own precious daughters. You can pick your friends, but you can't pick your family. Over the years, the three siblings have agreed and disagreed on many things. When one sibling stands against the rest for what ever reason, hearts are bound to feel hurt. These disagreements led the siblings to sometimes forget the true meaning of family. Barb was witness to how this discord had affected the three siblings' relationship and it broke her heart. Knowing that "pumpkin" was a nickname given to her oldest daughter, Tori, as a baby, she knew these would make perfect personalized gifts and symbols of what is important -family. 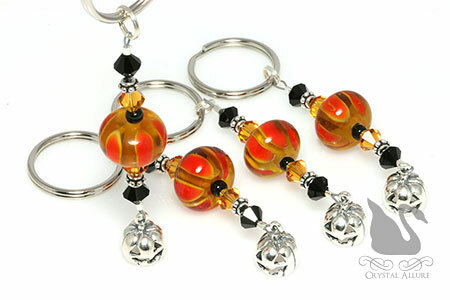 Barb gifted each of the girls with one Custom Pumpkin Lampwork Beaded Keychain and kept one for herself. The gift to the girls was to be a reminder they will always be family and they should stick together. The fourth key ring remained with Barb as a symbol to all three girls that she is always there for them -through thick and thin. October raises awareness of many causes that include Breast Cancer, Depression, Mental Illness and Red Ribbon Week -to name a few. As well, October is National Healthy Lung Month which is sponsored by the American Lung Association. The goal is to increase awareness of steps we can take to maintain healthy lungs. 1. Don't smoke! Cigarette smoking is a major cause of COPD, lung cancer and it destroys lung tissue. 2. Avoid exposure to pollutants that can damage your lungs such as secondhand smoke, outdoor air pollution and chemicals/bad air in both the home and at work. 3. You can prevent infections simply by washing your hands, getting a flu vaccine and brushing your teeth. Unfortunately, for some, even taking these preventative measures cannot save their lungs. For example, those with Cystic Fibrosis were born with the lung disease. No matter what precautions they take their lungs will eventually deteriorate to the point that they will need a lung transplant. That doesn't mean they shouldn't still take these precautions because they should still do anything they can to protect their lungs, for as long as they can. So, for me, Healthy Lung Month and Transplant go hand in hand. Which is why I created the Flight of Life Butterfly Transplant Awareness Necklace (NA104)! Not only does it raise awareness of healthy lungs, it represents the importance of organ donation and giving the Gift of Life. This inspiring handmade beaded necklace was designed for all those who are organ donors, transplant recipients and lung transplant survivors. 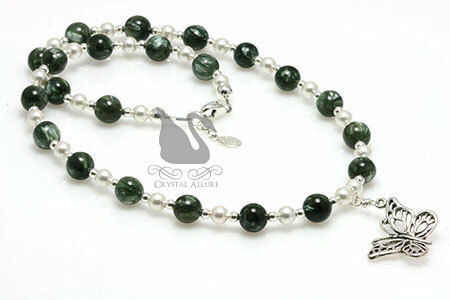 The 17-1/2" necklace features a beautiful sterling silver 30.15mm butterfly pendant (symbolizing life) with a full beaded strand of gorgeous green marble seraphinite gemstones, white Swarovski Pearls (hope) and sterling silver beads. Not only is green the nationally recognized ribbon color for Organ Donation and Transplant, it's also the awareness color for Healthy Lung Month! Did you know? It has been said when lungs are transplanted and take their first breath, it's like a butterfly opening its' wings. A beautiful symbol for what can only be described as a beautiful -life saving -event. That is why the Butterfly is a Symbol of Lung Transplant. Looking for more handmade Butterfly Awareness products? Check out Bronson Hill Arts handcrafted Flights of Life Butterfly Notecards, in support of Lungs for Life. Shark Week Inspired Jewelry Designs That Are Nothing To Be Afraid of! It shouldn't be too far-fetched then to see where the inspiration came from for a few of my beaded jewelry creations. Inspired by the crystal blue ocean water, the deep sea and what lies beneath. The focal of the Blue Artisan Lampwork Crystal Necklace (N124-B) is a mesmerizing handmade glass button pendant of swirling blue colors. It reminds of the ocean, swirling waves and...sharks! Complementing the artisan pendant are two different blue Swarovski Crystals, sterling silver, Bali beads and silver-lined seed beads that sparkle like the surface of the water and waves on a sunny day. Pair with this beach inspired necklace the Deep Blue Circle Crystal Beaded Earrings (E261), see below for purchase information. A stylish and contemporary pair of handmade beaded earrings featuring a blue ombre' effect. The sterling silver circles are meant to mimic the bubbles in the water while the blue Swarovski Crystals lead from a crystal clear blue surface to the deep blue ocean floor. If you love this set, you might want to check out the Green Artisan Lampwork Crystal Necklace (N124-G) too. It's a beautiful sea green in Swarovski Crystals and a handmade one of a kind original. 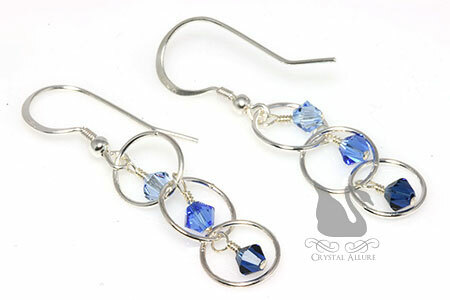 A stylish and contemporary pair of handmade beaded earrings featuring a blue sapphire ombre' effect. Like bubbles in water, sterling silver circle rings showcase a light sapphire, to sapphire to deep sapphire diamond shaped trio of sparkling Swarovski Crystals. Finished with sterling silver french hook ear wires. Length is 1" from the bottom of the ear wire. What is the Awareness Ribbon Color for my Cause? On a Facebook group that I belong to, someone asked the question, "Does anyone know the color ribbon for lung transplant?" I was actually surprised to see many responses that were either guesses or just not the correct color. The conversation then expanded into other related diseases and the awareness color for them. Having designed awareness jewelry for the past ten years, I have become quite familiar with awareness colors and their disease designations. What better inspiration for personalized jewelry than just about any color imaginable! I thought this was the perfect topic to blog about because it is such an important one. I'll review some of the awareness ribbon colors for the diseases/causes mentioned and then also provide some links to related articles. First, I'll address the question and then I will address two myths that came up during this discussion. So what awareness ribbon color represents transplant? The nationally recognized color for transplant is GREEN. Appropriately, green is also the awareness color for organ donation -which really makes sense because these two things do go hand-in-hand. To further expand on transplant awareness, did you know the butterfly is the national symbol for lung transplant. 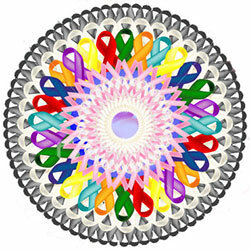 Awareness ribbon colors represent diseases only. Actually, that may have been the belief of a small number of individuals back when awareness ribbons first came into popularity. However, today, awareness ribbon colors represent causes, as well. The point behind awareness ribbons and the wearing of them is to RAISE AWARENESS of a particular cause or disease. In fact, many different causes and diseases can belong to the same color. Although this is not always the case, but, typically colors are designated by the cause or reason for the need or desire to raise awareness. Take for example, the yellow ribbon. This color ribbon became synonymous with troop and military support. How did it become the designation for this cause? The wife of a war hostage tied them around trees to raise awareness and bring attention to his release. Her actions resonated with many people across the world and the color yellow quickly became nationally recognized for raising awareness of troop and military support. Ever wondered about the History of the Awareness Ribbon? An awareness color is set because it is the brand color of the related charity or organization. It is likely any charity may take a nationally recognized awareness color and adopt it as their brand color. One such organization is Lungs for Life. They serve both the cystic fibrosis and the transplant communities and as such, have adopted the purple and green awareness colors for their brand. However, it is less likely to be the case that a color became nationally accepted because a charity used it in their brand and marketing efforts. Truth be told, there are so many causes, diseases/illnesses that affect so many people -it's highly unlikely these days that a color has not already been designated. 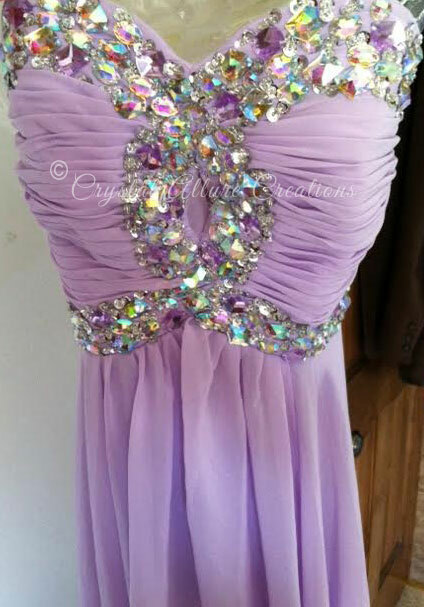 1) The color purple is nationally accepted and recognized as the awareness color for Cystic Fibrosis. Yet, a small percentage of people think blue represents the awareness color for CF. They believe this because the Cystic Fibrosis Foundation's brand color is blue. All this means is if they happen to purchase CF awareness products that are blue, they are simply supporting only the Cystic Fibrosis Foundation mission. 2) The colors red and blue are nationally recognized and accepted as the awareness colors for Pulmonary Fibrosis. In fact, with this particular disease, there is a touching story behind why those colors are nationally recognized. But, some believe the color is teal and that is because the Pulmonary Fibrosis Foundation has adopted teal as their brand color. Again, any awareness products in teal for PF are supporting only that charity and their mission. Why is Red and Blue the Awareness Colors for Pulmonary Fibrosis? Following a charities brand color as raising awareness for any cause, with probably the exception of Pink, can really limit: the power of a donors' dollars; the effectiveness of a volunteers' precious time; as well, it could limit the resources a cause recipient might benefit from. There is no shortage of information (or opinions) on awareness colors. Some causes/diseases have adopted many colors for the different disease sub-groups. You can see this with cancer and the many cancer subsets. For this reason, I have published a Guide to Cancer Awareness Colors. I hope you find it helpful! If I didn't mention your cause or disease in this post, feel free to read our jewelry articles on Awareness Colors and Meanings and Awareness Ribbons by Cause Color for a more comprehensive article on nationally recognized awareness ribbon color(s). Feel free to revisit these articles, from time to time, as I am always updating the information contained in them. I'd love to hear what cause you support! Leave a comment below. The Rosser Reeves Ruby is one of the world's largest star rubies at a whopping 138.7-carats! This famous ruby originated in Sri Lanka and was actually 140-carats when it first reached London and remained with an anonymous buyer until the early 1950s. It wasn't until 1953 when Robert Fisher of New York purchased the heavily scratched star ruby. Fisher had the stone restored to its original beauty, however, a few carats were sacrificed in the cutting/repolishing process. But, even at 138.7-carats the Rosser Reeves Ruby still places amongst the largest star rubies in the world. The next largest red star ruby is the 100.32-carat DeLong Star Ruby. Rosser Reeves purchased the star ruby in the late 1950s, but did not have the ruby set in beaded jewelry. Rather, he liked the stone so much he carried it around with him everywhere under the belief that it was a lucky stone and even referred to it as his 'baby'. Typically, it is believed your birthstone is a lucky stone for you, so it was interesting that Reeves, born in September, carried this July birthstone around instead. 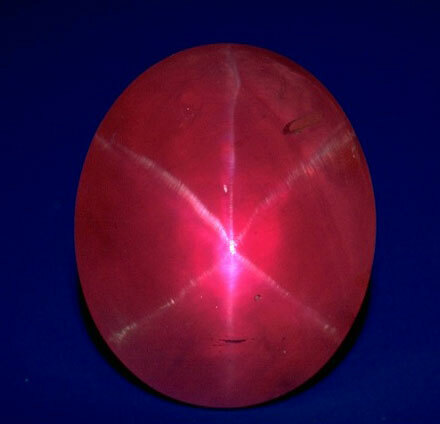 The Rosser Reeves Ruby is renowned for its excellent color and well defined, six-rayed asterism (star pattern). The star forms naturally when titanium atoms are trapped within the growing corundum crystal. 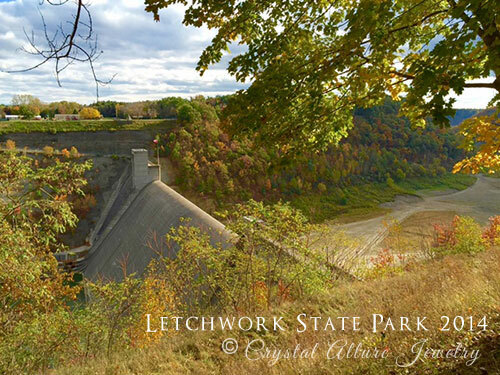 As the crystal cools, the titanium forms minute needle-like crystals of rutile mineral, which position themselves in three directions within the stone. As is the case with the Rosser Reeves Ruby, the stone was properly cut (or rather, re-cut), as to have the star centered. When the star is centered properly in these rare stones, the light enters and reflects off the three sets of needles to produce the six-ray star pattern (as seen in the image above). The Rosser Reeves Star Ruby was never placed in a beaded jewelry setting and fifteen years later in 1965, Reeves donated the stone to the Smithsonian Institute, where it resides today. Given that July is host to the all-American 4th of July celebrations -you could say the July born are just like firecrackers! Equally so, this red gemstone was named for one of Rome's biggest historical firecrackers, the dictator Julius Caesar, who died in a pool of his own blood. A rich blood red, the ruby is said to contain such heat that dropping it in a glass of water would make the water boil -now that it HOT! The fiery crimson red of the ruby is representative of love and passion, which also makes it a popular alternative to the classic diamond engagement ring. In fact, Fergie, the Duchess of York received a ruby engagement ring from Prince Andrew. Rubies arouse the senses, stir the imagination, and are said to be called the "king of gems" because it was believed to protect its wearer from evil. In fact, rubies were worn by royalty as a talisman against evil. Ruby is the red variety of the gems species corundum and is found as crystals within metamorphic rock. Its durability is second only to diamonds and the fact that it does not require special care, makes it a highly prized jewel for everyday wear. To find a flawless ruby is nearly impossible. As well, clarity is not the most important factor is determining a good quality ruby -it's the color. The richer the red, the more costly the gem. The most prized color is a medium or medium dark vivid red or slightly purplish red. A ruby is considered a Sapphire in any color except red. In essence, Ruby is a Sapphire, since both are identical in all properties except for color. There is a special glow to a ruby -literally. The chromium present in the natural reddest of rubies cause a red fluorescence, or 'glow', which is stimulated by UV (ultraviolet) light. Since ancient times, stories abound of rubies being self-luminous and are often called the "glowing stone" or "lamp stone". Greek legends told the story of a female stork, who repaid the kindness of Heraclea by bringing her a brilliant ruby – a ruby so bright that it illuminated Heraclea’s room at night. Fast forward and in 1960, a synthetic ruby was used in the creation of the first laser. However, long before rubies were used in modern technology, their special allure was purely for their believed symbolic qualities. Used in everything from ruby beaded jewelry to one of the gemstones used on the breastplate of Aaron. It was believed that the ruby held the power to warn its owner of coming misfortunes, illness, or death, by turning darker in color. More notably, Catherine of Aragon, the first wife of King Henry VIII, predicted her downfall after seeing the darkening of her ruby. From its history to modern times, this intensely red and passionate July birthstone continues to be a cherished treasure worn by all, especially when used in birthstone jewelry. Handmade beaded gemstone earrings designed with ruby Swarovski Crystals, pink dyed agate gemstones, sterling silver bead caps, beads and .925 Bali spacers on sterling silver french ear wire hooks. The length is 1-1/4" from the bottom of the ear wire. Pearls are June Birthstones: along with Pearl, Moonstone (Traditional: Alexandrite). There is so much history about pearls that five (5) months claim them as their birthstone: February, April, June (traditional), July and November. Pearls are an astral stone for the signs Gemini and Cancer are linked to the moon. Pearls have been called the "teardrops of the moon". Some believe that pearls were formed by the passage of angels through the clouds of heaven. Pearls are classic, elegant and may be expensive. They are very popular at the Gem Shows. Most fine jewellery in the 1900s was white and made from either diamonds or pearls. Queen Alexandra initially wore dog collar chokers, called a ‘collier de chien’ to cover a small scar on her neck. For state occasions and formal events she plastered herself in arrangements of pearl necklaces. The rarity value of real pearls then was such that an American skyscraper exchanged hands for the price of a pearl necklace. This is not as ridiculous as it seems, since fine south sea pearls still command a high price. Pearls were very fashionable, but still very, very costly. After the 1890s, Kokichi Mikimoto of Japan, produced highly acceptable cultured pearls by placing a small bead into an oyster shell. The bead coated itself with nacre (mother of pearl) and so good looking pearl jewels became more affordable. Various combinations of pearl necklaces come in and out of fashion with regularity so pearls too are a must. Both fake and real freshwater or cultured pearls are very affordable today. The price of pearls has dropped by about a fifth in the past 10 years and the Chinese are making waves in the pearl world with their cheaper prices. The Japanese have suffered disease in their pearl beds as well as facing competition and are finding it hard to compete with China’s prices. In the early 1900's, the financier Morton F. Plant exchanged the building for a Cartier two-strand Oriental pearl necklace much coveted by a woman he admired. A pearl is judged by its luster, size and markings. Although baroque, or unevenly formed, pearls have often been popular, it is the perfectly round ones that are now most desired. The best have a creamy, slightly pinkish glow. Black pearls (actually, a sort of silver-gray shade) are also coveted. Pearls are measured in millimeters, with 7 to 7.5 considered respectably modest while something larger than 10 millimeters becomes pretty important. For the last 70 years, they have been "farmed," which means the deformities have been given a helping hand. These pearls are called cultured, and today natural pearls are extremely rare. Most of the cultured pearls, Mr. Mondschein says, come from Japan, while the largest ones come from the South Seas, Burma, Tahiti and Australia. Pearls should always be kept in a soft pouch; they can be professionally cleaned with soap and water. "But spray perfume is the killer," says Mr. Mondschein. "I’ve seen people ruin pearls that way. And once the bloom is off the pearl, it can never come back." 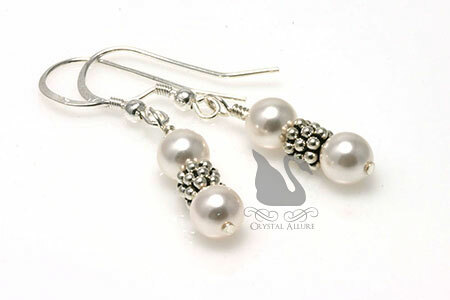 Handcrafted beaded earrings feature beautiful bridal white Swarovski Pearls separated by elegant .925 Bali and finished with sterling silver earwires. Length is 1" from bottom of earwire. In June of 2013, I had the distinct honor of working again with a truly wonderful person and returning customer, Holly. 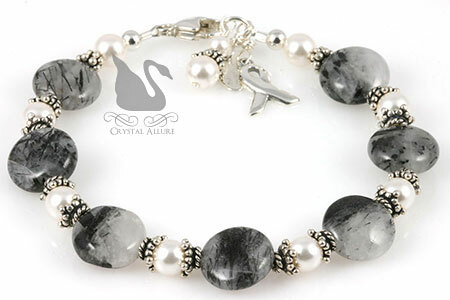 You may remember Holly's first design, our Exclusive Holly's Custom Hope Love Cherish Crystal Awareness Bracelet (B204). This time Holly requested a beautiful handmade beaded bracelet for her girl friend, Karin. This design would be a mother's bracelet. It was to have Karin's daughters' names: Olivia and Kate in it. Both girls' January birthstone, garnet, was to be in the design, along with possibly the color pink (which is Karin's favorite color). 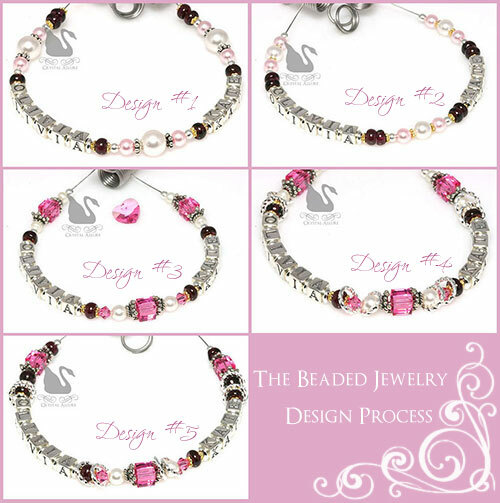 With each custom beaded jewelry design, I always email a "design in progress" photo to get feedback from the customer. As soon as Holly provided her design specs and idea came to mind (see below Design #1). This particular beaded bracelet design was perfect for highlighting the beaded jewelry design process. When creating a special custom bracelet, it can be the perfect design the first time at the bench or it may take several design attempts. The key to my custom jewelry designs is to get as many customer specs as possible into the design -because that is what makes the design truly unique and special. You can see in Design #1 below, all of Holly's specs were included in the idea I had after speaking with her. But -it just wasn't the design yet. Back to the bench. The challenge with this design was that although I am a huge fan of Swarovski Crystals, I'm not so in love with the garnet crystal. Of all the crystal colors available, to me, it just seems very dark. So, I opted to go with a genuine semi-precious garnet gemstone for this design. Design #2 keeps the same elements but reduces the size of the pearls. With some feedback from Holly, Design #3 keeps the semi-precious garnet and pearls, but splashes of pink crystal are added. 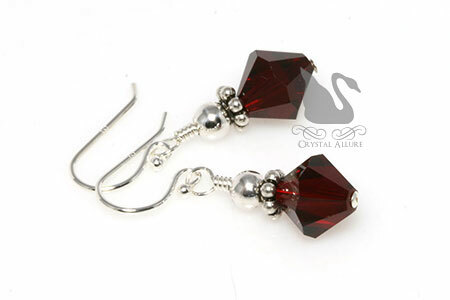 We both felt, the pink rose Swarovski Crystal added that touch of elegance that was lacking in the previous two designs. It was decided the design was on track but...it's just missing something...that, thing -that makes it the perfect design. Back to the bench and idea board. When I am creating, I find that taking a picture of the design and looking at it that way really helps to get a different point of view, so to speak. By Design #4, I decided to add in some texture and contrast with floating silver twisted rings. Design #5 keeps that momentum going but changes out the pearls near the ends with the garnet gemstone beads. This turns out to be Holly's favorite design. So, back to the bench to polish it up and finish the design. The final design (shown at the top of this post) features pink rose Swarovski Crystals, garnet semi-precious gemstones, sterling silver and 14k goldfill bead spacers, sterling letter blocks with floating silver rings. Finished with pink rose Swarovski Crystal Heart charm and our signature jewelry tag. After five attempts at the bench, Holly's Custom Pink Garnet Birthstone Name Mothers Bracelet (B212) emerged. This special design is a truly unique gift that Karin can treasure for a lifetime! 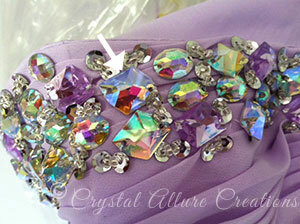 Thank you Holly for letting Crystal Allure Beaded Jewelry custom design this very special bracelet for you! The following guide is a comprehensive, alphabetized listing of awareness causes and their associated awareness ribbon color(s). All causes have been listed by their full medical term with abbreviations in parentheses. You can also use this guide to Shop by Cause. This extensive list has been an internet-wide reference tool for Awareness Colors and Meanings since 2004. (2) *NEW* by downloading our FREE guide in PDF format! To download the latest version simply click the image to the left or click on the following link: Crystal Allure Jewelry Awareness Ribbon Colors v1. You can also learn what day or month your cause is recognized nationally using the Awareness Calendar. Many groups have adopted color ribbons as symbols of support or awareness, and as a result, many causes often share the same color. As well, there may be more than one color associated with a cause, in which case, it is up to you on your ribbon color preference in support of that cause. Use this guide to locate the color associated with a specific cause, awareness disease or illness. For example, "What is the awareness color for asthma?" Look under the letter "A" and you will find the cause ribbon color associated with asthma. If you don't immediately find your cause, scan through the list for that particular letter. 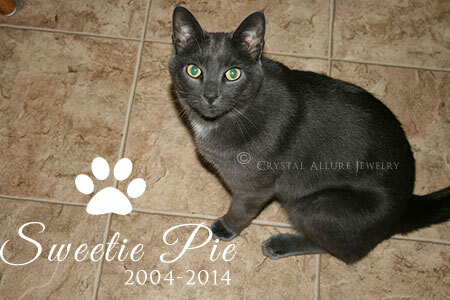 If you did not find the cause, disease or illness you were looking for, please feel free to contact us. 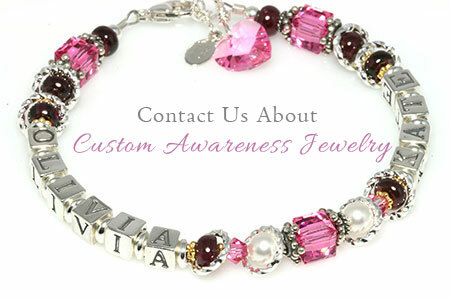 Inquire about a a custom awareness bracelet design or cause jewelry. Please note: This guide does not list awareness colors that charities have adopted for a specified cause. Rather, we choose to list the color that has been chosen for that cause and that most will identify with. 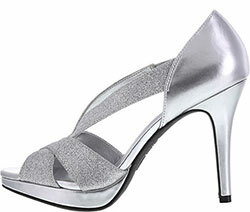 For example, you may find in your search that some will show the color, blue, in awareness items for Cystic Fibrosis. They do this because they are actually raising awareness for the Cystic Fibrosis Foundation. However, blue is not the awareness color for Cystic Fibrosis. The associated awareness color for Cystic Fibrosis (CF) is purple, as shown above. It is our goal, through our handcrafted awareness jewelry designs to raise awareness of the cause -not a specific charity.